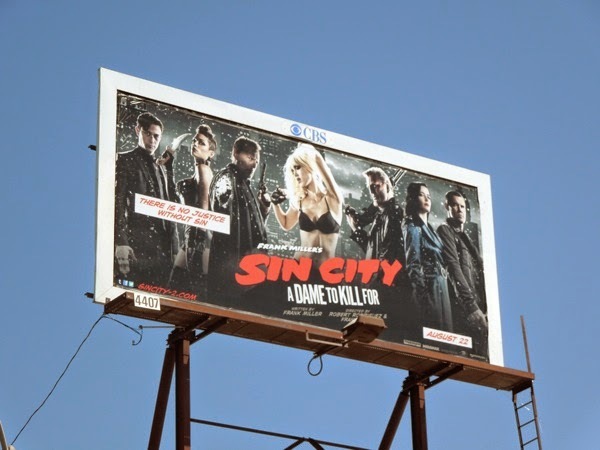 Almost a decade since the first movie hit cinema screens, and it's time to return to the seedy streets of Basin City in Sin City: A Dame to Kill For. Robert Rodriguez is back to help bring Frank Miller's noir Dark Horse Comics series to life, once again shooting against greenscreen and adding the scenery later to create the unique mostly black and white look of the film. Jessica Alba returns for another dance as 'Nancy Callahan', whilst Bruce Willis also reprises his role as 'John Hartigan', Mickey Rourke as 'Marv' (this sequel's intersecting storylines take place before and after the original allowing him to come back from the dead) and Rosario Dawson as 'Gail'. New additions to the cast include Eva Green as femme fatale 'Ava Lord' (who has been electrifying the small screen recently as 'Vanessa Ives' in Showtime's Penny Dreadful), Joseph Gordon-Levitt as 'Johnny' and Josh Brolin joins the cast in place of Clive Owen as 'Dwight McCarthy'. All these years later and comic book movies are still entertaining movie goers at the box office, with no real end in sight it seems. 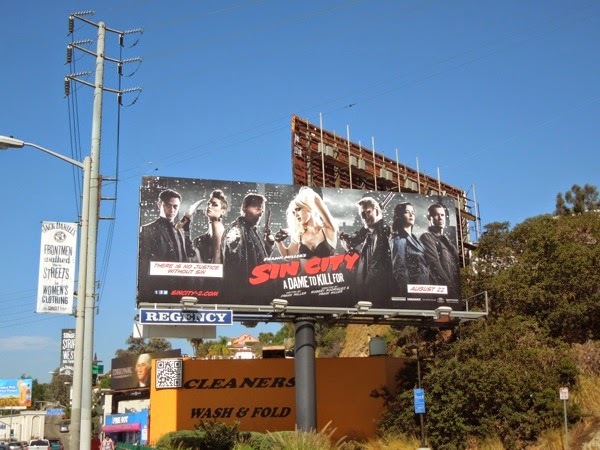 The atmospheric Sin City 2 landscape billboard was snapped along West Hollywood's Sunset Strip, whilst the smaller ad was spotted along Beverly Boulevard on July 30, 2014. 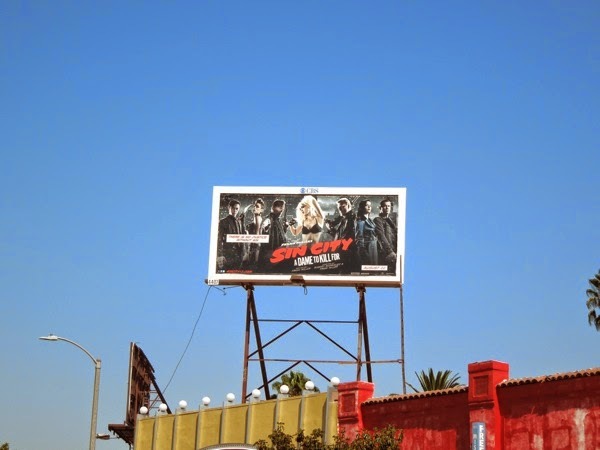 For similar stylistic billboards, be sure to also check out these billboards for 2008's The Spirit movie adaptation which was also directed by Frank Miller. 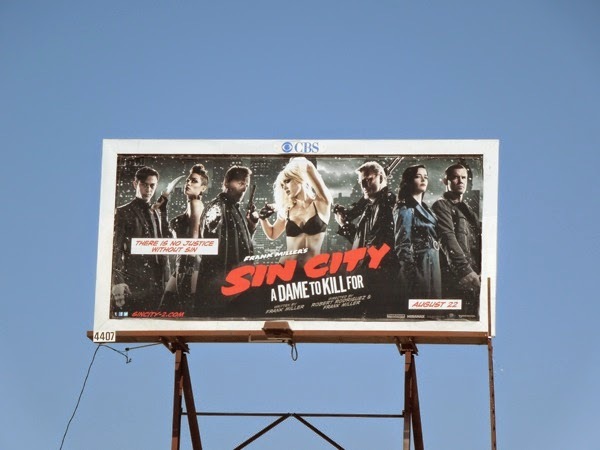 Plus for more Jessica Alba, be sure to check out the beautiful actress in these Zico coconut water billboards from recent months in the skies around L.A.